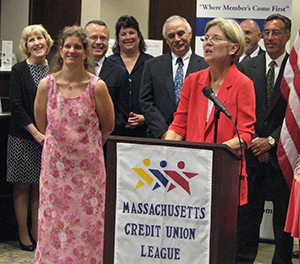 Last week, Elizabeth Warren received the endorsement of the Massachusetts Credit Union League at an event held at Worcester Credit Union’s Main Street branch. The League is one of the oldest U.S. trades groups still in operation, and this marks the first time they have officially endorsed a candidate for public office. “Elizabeth Warren has been a strong and vocal proponent of the benefits that credit unions provide to working families across the Commonwealth and around the country,” the League’s President Dan Egan said at the endorsement event. Elizabeth has devoted her career to building a credit market that works for American families, for lenders who want to serve those families, and for the economy as a whole. The League’s endorsement shows that Elizabeth’s vision for credit markets has gained traction from responsible lenders. The credit union endorsement coincided with the one-year anniversary of the Consumer Financial Protection Bureau opening its doors. In her remarks, Elizabeth emphasized that the mission of every credit union is to serve their members — the same value that she aimed to incorporate into the new consumer agency’s DNA. “It is our hope and expectation that Elizabeth will ensure that credit unions and their members have an advocate in the Senate,” said Egan. Elizabeth reiterated that she will continue to fight for a level playing field and serve as a voice for Massachusetts credit unions. There are more than 200 credit unions in the Commonwealth with more than 2.5 million members.